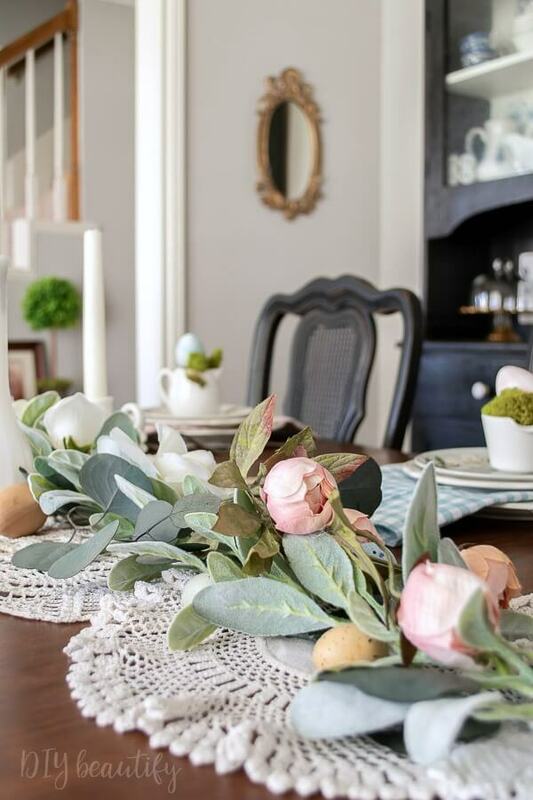 My Spring tablescape was inspired by vintage items and collectibles that I've gathered over the years. 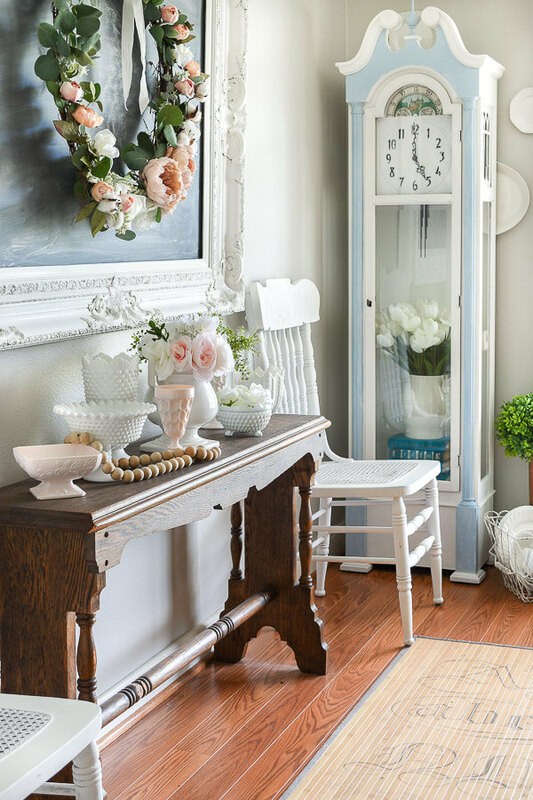 I layered it all together in my dining room to create a shabby cottage feel that makes you want to linger over another piece of pie! 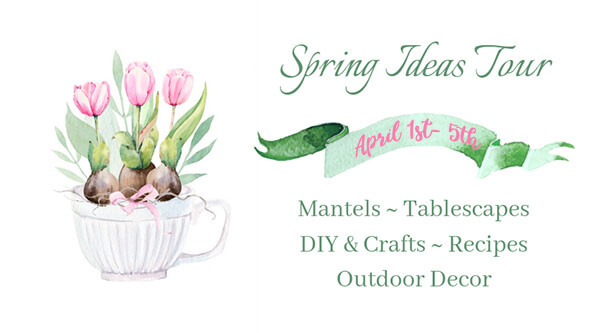 This week I've joined Angie from Postcards from the Ridge and several other home decor bloggers to share our decor for the Spring Ideas Tour! 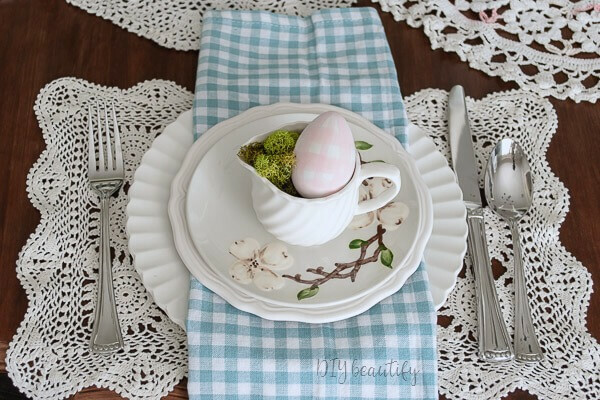 You'll find all the decor and links at the end of my vintage Spring table. 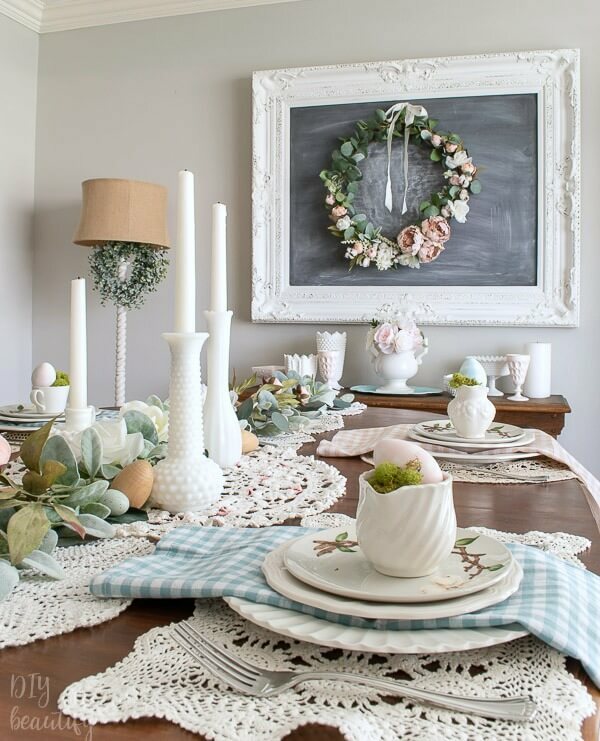 I was really feeling all the shabby, cottage-y, vintage vibes for my Spring decor this year! Maybe because I have a large collection of beautiful items that I hardly ever use...there was a time I was shopping at two different huge Goodwill stores weekly and finding amazing deals left and right...so I amassed quite a collection of white ironstone pitchers and dishes, vintage doilies and embroidered tablecloths, even some pink milk glass for literally a couple bucks! Normally these cherished collectibles sit in a drawer or are on display in one of my hutches. 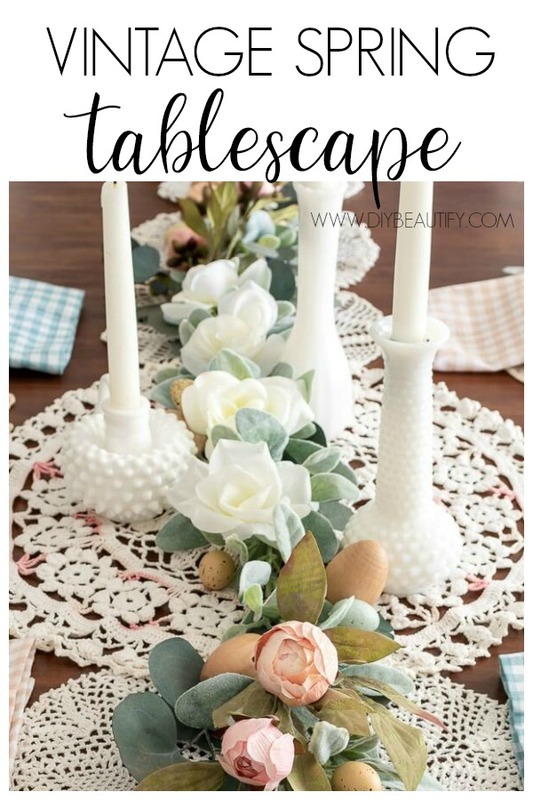 I guess I was feeling their pull, and decided to bring them out into the light and use them to put together a vintage Spring tablescape that has all the shabby-chic, cottage feels! This year the bunnies stayed packed away in the attic. I recently painted this grandfather clock and made the cottage floral wreath that is hanging on my huge chalkboard. Those pieces probably kick-started the whole feeling in this room! I will be the first to admit that we don't eat around this table much...it feels too formal! But that actually makes it easier to decorate because I can play around with different ideas and leave the mess sitting out! Over the last couple of weeks I've created a couple of different looks in here before I settled on the one I'm sharing today. Here's a peek at some of the styles I created before settling on the one I'm sharing today. I wish I could tell you that all these amazing doilies came from my grandmothers, but they are nearly all thrift store finds! My mom actually made a couple of them. I can't believe all the time and love that went into making each one...I almost felt guilty paying only .50 or $1 for them! In the end, I blame it all on the blush peonies that I found at Michaels! I still had a couple of stems that didn't go into my Spring wreaths, and I knew I needed to find a way to make them work! And I did! 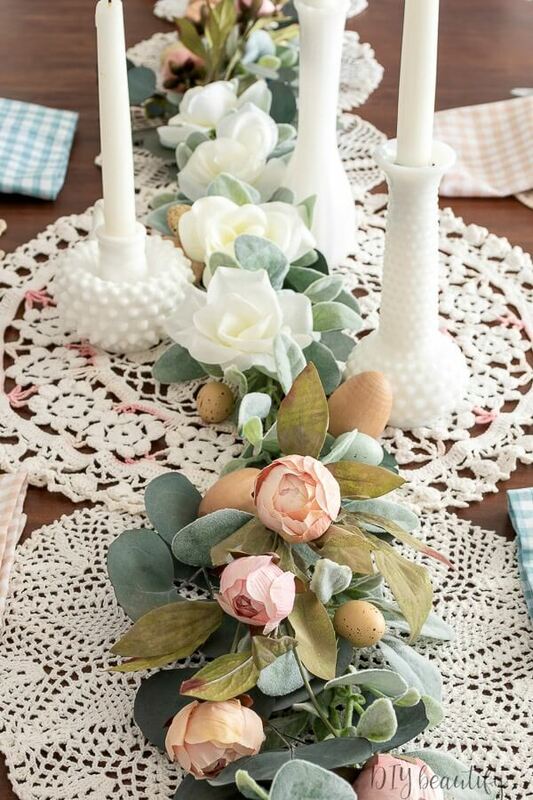 I made a garland to lay across my table with florals and greenery, tucking in some natural looking eggs. 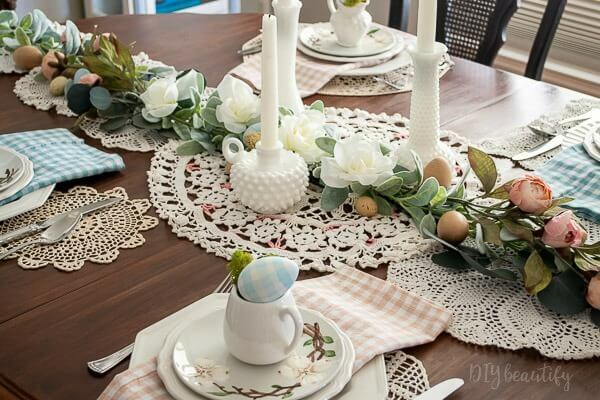 I layered the doilies along the center of my table to make a table runner. I used a variety of sizes but tried to stick with all light colors, starting with the largest one in the center and going smaller. 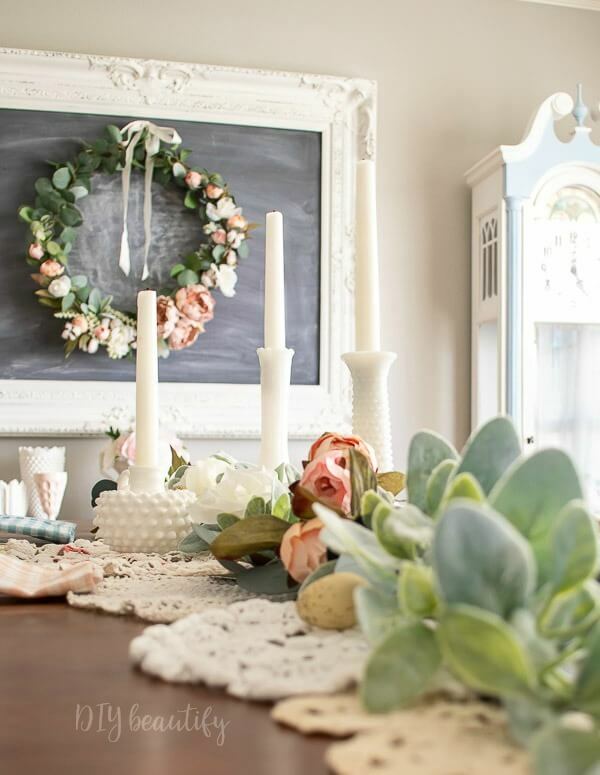 Next I layered a lambs ear garland, some silver dollar eucalyptus and those gorgeous peonies down the center of the table. I was left with a little gap in the middle, so I added a few white roses from the dollar store. I tucked in some wood eggs as well as some speckled eggs that I had in my Easter stash up in the attic. While I was up there, I also grabbed the gingham eggs that I painted several years ago. They worked beautifully in this table setting. My layered dishes are all from the thrift store! I have a dinner dish, then a gingham napkin, a lunch dish, topped by a pickle dish...I just found these recently. They are the Dogwood design Orchard Ware, vintage plates from the 40's and 50's. 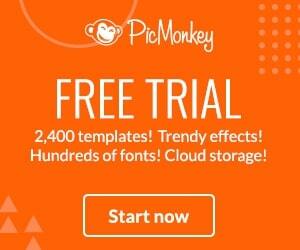 I noticed they were smaller than a lunch or dessert plate. I found out there is such a thing as a "pickle plate"...I guess pickles were a hot item back in the day! The plates are a very soft mint color with painted dogwood stems on them. They're just beautiful! 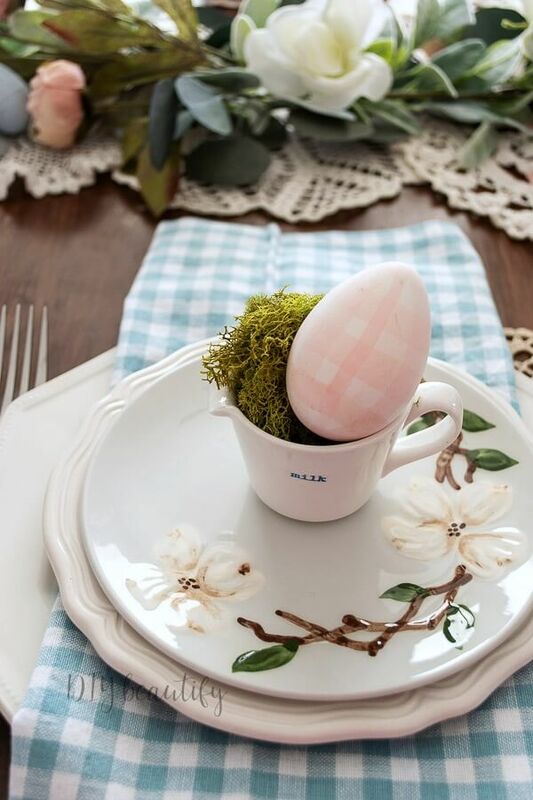 Each place setting has a mini ironstone pitcher filled with a little moss to support one of my hand painted eggs. It was quick and easy to put together! 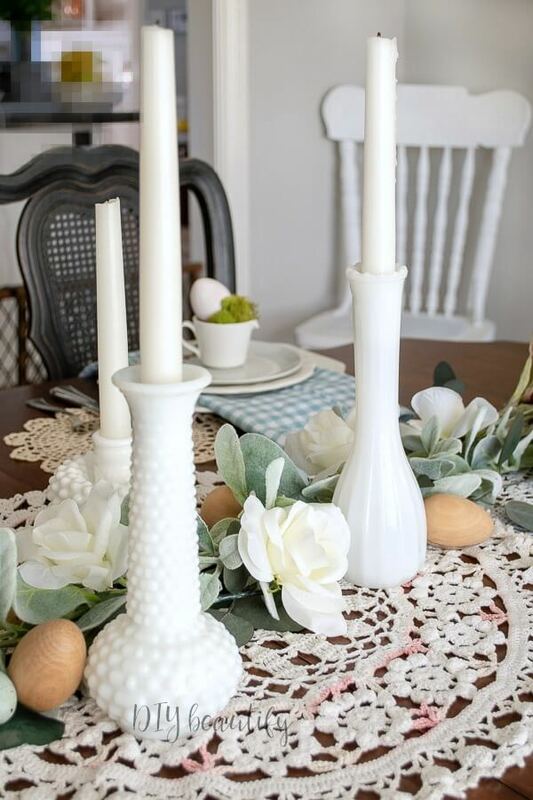 I added some milk glass vases to the largest doily in the center. You can add taper candles to these, but you need to beef up the bottom a little because the hole of the vase is usually wider than the candle. I wrap a narrow piece of tin foil around the candle base and then it is supported in the vase! Aside from the napkins and the flowers, everything else was pulled from a drawer or cabinet in my home! 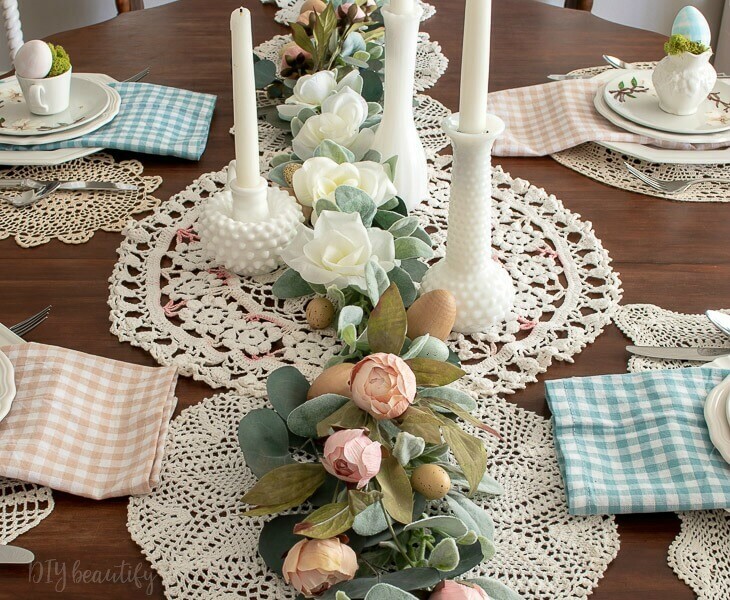 I really love how it looks and how all these vintage shabby items work together to create a beautiful Spring table! You probably have some great items packed away or folded in a drawer and forgotten! Remember those??? Go grab them out and see what you can create for Easter! 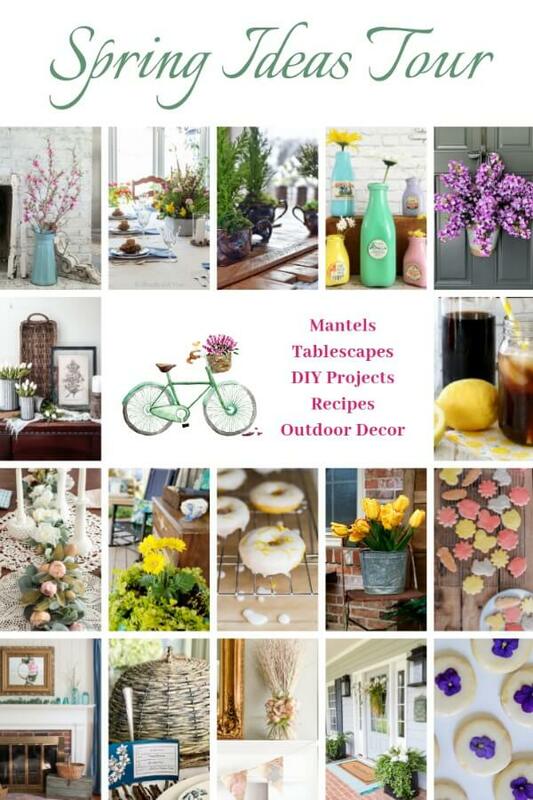 Here are all of our great spring ideas! Check back all week for each day's new posts. Oh it's so pretty Cindy. I love your color palette. I'm a big fan of vintage finds and isn't it great when you can actually use them. Thanks so much Patti, yes they were all begging to be used!! Thanks Angie, it was fun to pull them out for this tablescape! What a beautiful table, Cindy! I love the colors that you used and especially love seeing all of your vintage finds. Hi Cindy...first off...love that old clock and the colors you painted it! It's just charming. And I can see how it led you to your table decor. I still have doilies that my Grandma either crocheted or collected tucked away in a drawer somewhere. I love how you used all different shapes and sizes on your table and I am going to pull some of mine out for that very use! Thanks for the inspiration. I really like the idea of placing a pitcher on the plate with some cuteness, Cindy. I always use the cup and saucer for the same, but a pitcher is a fun change. Cute cottagy table! Love the candles in the milkglass. 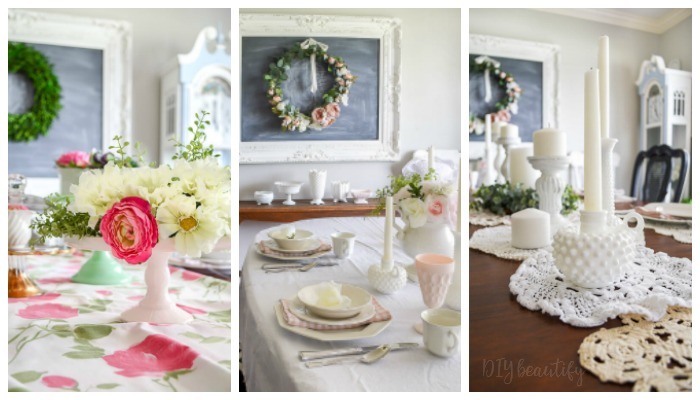 Cindy, your tablescape is so pretty! I especially love the peony garland down the center! So pretty! Love gingham and so sweet in the pastel tones.